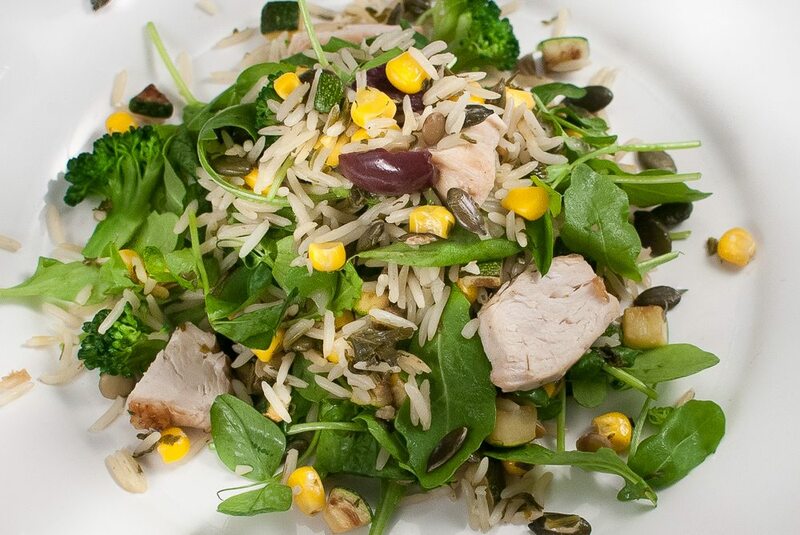 NB: The salad can be eaten ‘warm’ with the rice hotter than room temperature – i.e. soon after cooking – or it can be eaten cool. To cool, empty the rice into an oven tray or large plate after resting to cool. When cool put in the fridge until needed. Cook the pilaf. Wash and dry the rice. Drain the corn. Wash, dry and chop the herbs. Add 1 tbs of olive oil to a saucepan and heat to medium heat. Add the chopped shallots and fry gently for 5 minutes until soft. Weigh the rice and then measure the volume. Add the rice and fry for 5 minutes. Measure boiling water which is one and a half times the volume of rice and add to the pan. Then add the herbs and the corn. Stir, put on a lid and set the heat to the lowest setting. Cook for 20 minutes, turn off the heat and leave to rest for 10 minutes. Cook the lentils. Boil a half a pan of water and add the lentils. Cook according to the instructions or until tender but still with a definite bite. Drain, then put back in the pan and add a splash of wine vinegar and mix. Then add a drizzle of virgin olive oil and mix. Set to one side. Cook the chicken. Fry the chicken skin side down in oil for about 3 or 4 minutes until the skin is browned. Turn over and cook for 3 or 4 more minutes. Transfer to a oven tray and cook in the oven for 10 minutes or until the chicken is cooked through. Do not over cook. Cool the chicken and slice into pieces. Toast the seeds. Toast the pumpkin seeds in a dry frying pan until they start to pop. Put onto a plate to cool and set aside. Cook the broccoli. Chop the broccoli into very small florets and pieces. Add to a pan of boiling water and cook for 2 minutes. Drain and refresh in cold water. Drain and set aside. Cook the courgette. Cut the courgette in half length-ways and with a spoon scoop out the soft seeds. Chop the courgette about the same size as a sweetcorn kernel. Fry in a little olive oil until browned, put on a plate to cool and set aside. Assemble the salad. Using a large bowl, toss the rice to cool slightly (see note above). Add the lentils, pumpkin seeds, broccoli. The salad leaves and chicken can be mixed in with the salad, or served separately. Season to taste. Drizzle with virgin olive oil and a good squeeze of lemon. Garnish with olives.